Worldwide retail sales—including in-store and internet purchases—will surpass $22 trillion in 2015, up 5.6% from 2014. Retail ecommerce sales, those purchased over the internet, will make up 7.4% of the total retail market worldwide, or $1.671 trillion. By 2019, that share will jump to $3.578 trillion, yet retail ecommerce will account for just 12.8% of retail purchases. 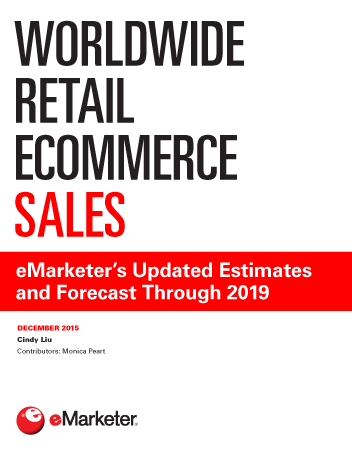 eMarketer estimates that global retail sales growth is slowing, but year-over-year increases will continue, mainly fueled by sales in China, India, the US and developing countries in the Middle East and Africa. Retail ecommerce sales are accelerating faster than previously anticipated and will jump 25.1% year on year in 2015. Ecommerce sales growth will outpace brick-and-mortar sales growth by a more than 3-to-1 margin over our forecast period. Asia-Pacific will be the main driver behind this growth, accounting for over half of global retail ecommerce sales in 2015, or $877.61 billion. We expect ecommerce sales in the region to climb $1.459 trillion by 2019, contributing to over three-fourths of the worldwide growth of $1.907 trillion. In 2015, over half of all internet users worldwide and 24.3% of the global population will be digital buyers. Nearly half of these digital buyers will reside in Asia-Pacific, even though they account for only 22.5% of the region’s population. "Retail ecommerce will reach $1.671 trillion this year, up 25.1% from 2014. eMarketer expects online sales will grow at double-digit rates throughout the forecast period, reaching $3.578 trillion in 2019."